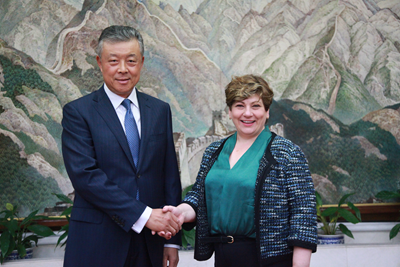 On July 26, Ambassador Liu Xiaoming met with Emily Thornberry, Labour's Shadow First Secretary of State and Foreign Secretary, at the Embassy. Shadow Foreign Minister Helen Goodman and Minister Ma Hui of the Embassy were present. Ambassador Liu commended the Labour Party for its commitment to developing relations with China over the years and spoke highly of the previous Labour government for the contribution to China-UK ties. He said that this year marks the 45th anniversary of China-UK ambassadorial relations, and it is also a year to deepen China-UK ties in the "Golden Era". China is willing to work with the British people from all walks of life, including the Labour Party, to deepen the exchanges and cooperation in various fields and to contribute more to China-UK "Golden Era". 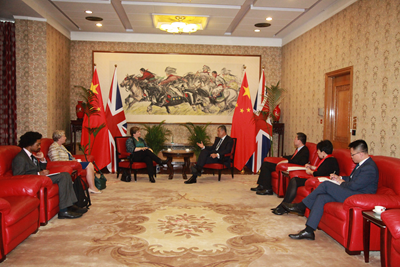 Thornberry said that the Labour Party attaches great importance to the relationship with China and stands ready to continue to strengthen exchanges and cooperation and enhance mutual understanding and friendship with China. With joint efforts of both sides, the UK-China relations in the "Golden Era" could bear more fruitful outcomes and deliver for the two peoples.